A week ago, as I returned to “reality” after a multi-day retreat, I started a “gratitude” journal on the advice of a friend. My friend told me how she has kept a journal for the past year, to help her focus on the good things taking place in her life - even when the “blecky” stuff came crashing down around her. Since I’ve been trying to SEE life HALF-FULL this year, I decided keeping a gratitude journal might help me, well, adjust my attitude. I’ll admit, it’s been an interesting first week. Some days, it was much easier to find something to be grateful about, than others. 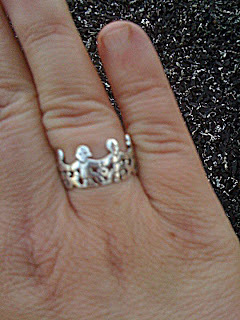 Monday, my gratitude revolved around finding my “circle of children” ring, I lost the night before in Denni’s back yard. I was tremendously grateful for a friend who helped me search (for more than an hour) in the grass, for a priceless (because of sentimental reasons) ring. I was also grateful for a friend who loaned me a metal detector, to help jumpstart the search, and Denni’s kidlets, who helped search for the ring – in between playing on the swing set. The first day helped set the tone for my week. Other days I found myself grateful for a great brainstorming session revolving around the spring mission trip, a long phone conversation with my cousin, and a four-hour nap (yes, apparently I was tired) on Saturday. I know I’ve only been journaling my gratitude for a week, but I think it’s already helping me “adjust” my attitude, and see life differently – half-full, rather than empty. I know it’s helped me go to bed each night focusing on something positive, rather than the usual worries. My friend said looking back over her gratitude journal helped paint an interesting picture of her life over the course of the last year. I know she’s still processing the impact of this effort. I’m not sure what God is teaching me, by keeping a gratitude journal, but I’m open to the lesson. I guess you could say I’m grateful for the chance to have this life lesson.